Homer’s timeless description of the spectacular shield of Achilles has often given pause to thinkers throughout history and across the world. Why does Homer lavish so much detail on Achilles’ shield? What does this shield, forged by Hephaistos, really look like? In the following guest post, Corry Shores of Pirates and Revolutionaries combines Friedrich Schiller’s philosophical view of aesthetics with a full gallery of images. In the process, Corry offers a deeper appreciation for the various ways one philosopher and many artists have interpreted the appearance of Achilles’ legendary shield. Can you imagine an Iliad in which Achilles does not receive his divine armor? For a short span of history, in one incredulous blink of a tempestuous eye of Fate, the fabulous shield of Achilles actually disappeared from Homer’s Iliad. and as such makes up our oldest example of extended ekphrasis, the verbal description of an object or work of art. In ancient times, this lengthy digression led Zenodotus to eliminate the passage from his edition altogether. Other readers, however, have perceived the powerful narrative effect of an extended pause just at the crucial turning point of the story, as though it were — as Oliver Taplin called it — the calm before the storm. Can you imagine it? Considering the description of Achilles’ shield way too over the top, Zenodotus of Ephesus [330-260 BCE], emboldened in his role as the Library of Alexandria’s first superintendent, waves his solid gold fountain pen in the air like a magic wand and POOOF! Just like that, rejected and banished, the shield passages simply disappear from Zenodotus’ “authorized” edition of Homer’s Iliad. However, in another equally tempestuous blink of an eye, his colleagues at the Library tossed Zenodotus’ magic wand into the Mediterranean and reinstated Achilles’ shield in subsequent “authorized” manuscripts. Thankfully, this action ultimately preserved the shield’s elaborate description for readers throughout history to marvel over and contemplate its spectacular appearance. 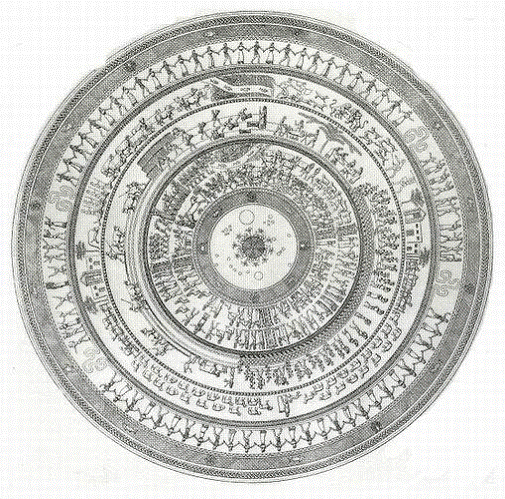 In this guest post, Corry Shores delves into the question of what Achilles’ shield looks like while reflecting on an intriguing discussion of Achilles’ shield in a philosophical essay on aesthetics by Frederich Schiller. Frederich Schiller [1759-1805] was a German poet, philosopher, physician, historian, and playwright. From his late twenties until his death at 45, Schiller was a strong friend of fellow writer and playwright Goethe, who premiered many of Schiller’s plays and together they frequently discussed the topic of aesthetics. Considering that the Flemish painter Peter Paul Rubens [1577-1640] is recognized among the top masters in the world, Schiller’s point is sadly blunted but his esteem for the grand and noble ideals of the ancient Greeks is nevertheless appreciated and recognized by most of the world’s deep thinkers throughout history. 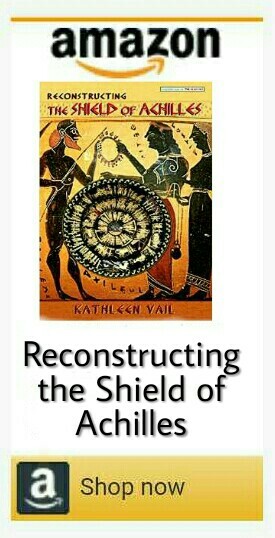 Discovering Corry Shore’s blogspot by a lucky stroke of fate nearly 10 years ago, I was quite honored by the amount of time and work he put into his post combining Schiller’s words with images of my reconstruction of Achilles’ Shield. At the time, my reconstruction was published on a 1990’s-era website that is terribly outdated. Now, with TheShieldofAchilles.net up and running, I’m super excited to finally and publicly thank Corry for the beautiful post he created and for the early exposure he offered of my work. With his permission, I have republished his article, below, as a guest post. The poet treats his subject in a common manner when in the execution of his theme he dwells on valueless facts and only skims rapidly over those that are important. He treats his theme with grandeur when he associates with it what is great. For example, Homer treated the shield of Achilles grandly, though the making of a shield, looking merely at the matter, is a very commonplace affair. At the beginning of the eighteenth book, Achilles receives the news that Patrocolus has died, and the great armor which Achilles had lent him has been stripped by Hector. Achilles is devastated, and his anger at Agamemnon suddenly seems insignificant, as grief for his friend swells into an intense rage directed at himself and at Hector. While he is waiting for his mother, Thetis, to deliver new armor from the smith-god Hephaestus, he goes out before the ships, with flames encircling his head, and frightens the Trojans with three terrible screams. … Hephaestus laments that he cannot protect Achilles from his fate, and then begins work on the shield, knowing that it will not save his life, but only serve him long enough to take revenge. So saying he left her there and went unto his bellows, and he turned these toward the fire and bade them work. And the bellows, twenty in all, blew upon the melting-vats, sending forth a ready blast of every force, now to further him as he laboured hard, and again in whatsoever way Hephaestus might wish and his work go on. And on the fire he put stubborn bronze and tin  and precious gold and silver; and thereafter he set on the anvil-block a great anvil, and took in one hand a massive hammer, and in the other took he the tongs. First fashioned he a shield, great and sturdy, adorning it cunningly in every part, and round about it set a bright rim,  threefold and glittering, and therefrom made fast a silver baldric. Five were the layers of the shield itself; and on it he wrought many curious devices with cunning skill. Therein he wrought the earth, therein the heavens therein the sea, and the unwearied sun, and the moon at the full,  and therein all the constellations wherewith heaven is crowned–the Pleiades, and the Hyades and the mighty Orion, and the Bear, that men call also the Wain, that circleth ever in her place, and watcheth Orion, and alone hath no part in the baths of Ocean. Therein fashioned he also two cities of mortal men exceeding fair. In the one there were marriages and feastings, and by the light of the blazing torches they were leading the brides from their bowers through the city, and loud rose the bridal song. And young men were whirling in the dance, and in their midst  flutes and lyres sounded continually; and there the women stood each before her door and marvelled. But the folk were gathered in the place of assembly; for there a strife had arisen, and two men were striving about the blood-price of a man slain; the one avowed that he had paid all,  declaring his cause to the people, but the other refused to accept aught; and each was fain to win the issue on the word of a daysman. Moreover, the folk were cheering both, shewing favour to this side and to that. And heralds held back the folk, and the elders were sitting upon polished stones in the sacred circle,  holding in their hands the staves of the loud-voiced heralds. Therewith then would they spring up and give judgment, each in turn. And in the midst lay two talents of gold, to be given to him whoso among them should utter the most righteous judgment. But around the other city lay in leaguer two hosts of warriors  gleaming in armour. And twofold plans found favour with them, either to lay waste the town or to divide in portions twain all the substance that the lovely city contained within. but the rest were faring forth, led of Ares and Pallas Athene, both fashioned in gold, and of gold was the raiment wherewith they were clad. Goodly were they and tall in their harness, as beseemeth gods, clear to view amid the rest, and the folk at their feet were smaller. And these came presently, and two herdsmen followed with them playing upon pipes; and of the guile wist they not at all. But the liers-in-wait, when they saw these coming on, rushed forth against them and speedily cut off the herds of cattle and fair flocks of white-fleeced sheep, and slew the herdsmen withal. But the besiegers, as they sat before the places of gathering and heard much tumult among the kine, mounted forthwith behind their high-stepping horses, and set out thitherward, and speedily came upon them. Then set they their battle in array and fought beside the river banks, and were ever smiting one another with bronze-tipped spears. And amid them Strife and Tumult joined in the fray, and deadly Fate, grasping one man alive, fresh-wounded, another without a wound, and another she dragged dead through the mellay by the feet; and the raiment that she had about her shoulders was red with the blood of men. Even as living mortals joined they in the fray and fought;  and they were haling away each the bodies of the others’ slain. Therein he set also a king’s demesne-land, wherein labourers were reaping, bearing sharp sickles in their hands. Some handfuls were falling in rows to the ground along the swathe, while others the binders of sheaves were binding with twisted ropes of straw. Three binders stood hard by them, while behind them  boys would gather the handfuls, and bearing them in their arms would busily give them to the binders; and among them the king, staff in hand, was standing in silence at the swathe, joying in his heart. And heralds apart beneath an oak were making ready a feast, and were dressing a great ox they had slain for sacrifice; and the women  sprinkled the flesh with white barley in abundance, for the workers’ mid-day meal. And therein he wrought a herd of straight-horned kine: the kine were fashioned of gold and tin,  and with lowing hasted they forth from byre to pasture beside the sounding river, beside the waving reed. And golden were the herdsmen that walked beside the kine, four in number, and nine dogs swift of foot followed after them. But two dread lions amid the foremost kine  were holding a loud-lowing bull, and he, bellowing mightily, was haled of them, while after him pursued the dogs and young men. The lions twain had rent the hide of the great bull, and were devouring the inward parts and the black blood, while the herdsmen vainly sought to fright them, tarring on the swift hounds. Howbeit these shrank from fastening on the lions, but stood hard by and barked and sprang aside. and now again would they run in rows toward each other. And a great company stood around the lovely dance, taking joy therein;  and two tumblers whirled up and down through the midst of them as leaders in the dance. But when he had wrought the shield, great and sturdy,  then wrought he for him a corselet brighter than the blaze of fire, and he wrought for him a heavy helmet, fitted to his temples, a fair helm, richly-dight, and set thereon a crest of gold; and he wrought him greaves of pliant tin. But when the glorious god of the two strong arms had fashioned all the armour,  he took and laid it before the mother of Achilles. And like a falcon she sprang down from snowy Olympus, bearing the flashing armour from Hephaestus. hôs eipôn tên men lipen autou, bê d’ epi phusas: tas d’ es pur etrepse keleuse te ergazesthai. 470 phusai d’ en choanoisin eeikosi pasai ephusôn pantoiên euprêston aütmên exanieisai, allote men speudonti paremmenai, allote d’ aute, hoppôs Hêphaistos t’ etheloi kai ergon anoito. chalkon d’ en puri ballen ateirea kassiteron te 475 kai chruson timênta kai arguron: autar epeita thêken en akmothetôi megan akmona, gento de cheiri rhaistêra kraterên, heterêphi de gento puragrên. poiei de prôtista sakos mega te stibaron te pantose daidallôn, peri d’ antuga balle phaeinên 480 triplaka marmareên, ek d’ argureon telamôna. pente d’ ar’ autou esan sakeos ptuches: autar en autôi poiei daidala polla iduiêisi prapidessin. en men gaian eteux’, en d’ ouranon, en de thalassan, êelion t’ akamanta selênên te plêthousan, 485 en de ta teirea panta, ta t’ ouranos estephanôtai, Plêïadas th’ Huadas te to te sthenos Ôriônos Arkton th’, hên kai Amaxan epiklêsin kaleousin, hê t’ autou strephetai kai t’ Ôriôna dokeuei, oiê d’ ammoros esti loetrôn Ôkeanoio. en de duô poiêse poleis meropôn anthrôpôn kalas. en têi men rha gamoi t’ esan eilapinai te, numphas d’ ek thalamôn daïdôn hupo lampomenaôn êgineon ana astu, polus d’ humenaios orôrei: kouroi d’ orchêstêres edineon, en d’ ara toisin 495 auloi phorminges te boên echon: hai de gunaikes histamenai thaumazon epi prothuroisin hekastê. laoi d’ ein agorêi esan athrooi: entha de neikos ôrôrei, duo d’ andres eneikeon heineka poinês andros apophthimenou: ho men eucheto pant’ apodounai 500 dêmôi piphauskôn, ho d’ anaineto mêden helesthai: amphô d’ hiesthên epi istori peirar helesthai. laoi d’ amphoteroisin epêpuon amphis arôgoi: kêrukes d’ ara laon erêtuon: hoi de gerontes heiat’ epi xestoisi lithois hierôi eni kuklôi, 505 skêptra de kêrukôn en chers’ echon êerophônôn: toisin epeit’ êïsson, amoibêdis de dikazon. keito d’ ar’ en messoisi duô chrusoio talanta, tôi domen hos meta toisi dikên ithuntata eipoi. tên d’ heterên polin amphi duô stratoi hêato laôn 510 teuchesi lampomenoi: dicha de sphisin hêndane boulê, êe diapratheein ê andicha panta dasasthai ktêsin hosên ptoliethron epêraton entos eergen: hoi d’ ou pô peithonto, lochôi d’ hupethôrêssonto. teichos men rh’ alochoi te philai kai nêpia tekna 515 rhuat’ ephestaotes, meta d’ aneres hous eche gêras: hoi d’ isan: êrche d’ ara sphin Arês kai Pallas Athênê amphô chruseiô, chruseia de heimata hesthên, kalô kai megalô sun teuchesin, hôs te theô per amphis arizêlô: laoi d’ hupolizones êsan. 520 hoi d’ hote dê rh’ hikanon hothi sphisin eike lochêsai en potamôi, hothi t’ ardmos eên pantessi botoisin, enth’ ara toi g’ hizont’ eilumenoi aithopi chalkôi. toisi d’ epeit’ apaneuthe duô skopoi heiato laôn degmenoi hoppote mêla idoiato kai helikas bous. 525 hoi de tacha progenonto, duô d’ ham’ heponto nomêes terpomenoi surinxi: dolon d’ ou ti pronoêsan. hoi men ta proïdontes epedramon, ôka d’ epeita tamnont’ amphi boôn agelas kai pôea kala argenneôn oiôn, kteinon d’ epi mêlobotêras. 530 hoi d’ hôs oun eputhonto polun keladon para bousin eiraôn proparoithe kathêmenoi, autik’ eph’ hippôn bantes aersipodôn metekiathon, aipsa d’ hikonto. stêsamenoi d’ emachonto machên potamoio par’ ochthas, ballon d’ allêlous chalkêresin encheiêisin. 535 en d’ Eris en de Kudoimos homileon, en d’ oloê Kêr, allon zôon echousa neoutaton, allon aouton, allon tethnêôta kata mothon helke podoiin: heima d’ ech’ amph’ ômoisi daphoineon haimati phôtôn. hômileun d’ hôs te zôoi brotoi êd’ emachonto, 540 nekrous t’ allêlôn eruon katatethnêôtas. en d’ etithei neion malakên pieiran arouran eureian tripolon: polloi d’ arotêres en autêi zeugea dineuontes elastreon entha kai entha. hoi d’ hopote strepsantes hikoiato telson arourês, 545 toisi d’ epeit’ en chersi depas meliêdeos oinou dosken anêr epiôn: toi de strepsaskon an’ ogmous, hiemenoi neioio batheiês telson hikesthai. hê de melainet’ opisthen, arêromenêi de eôikei, chruseiê per eousa: to dê peri thauma tetukto. 550 en d’ etithei temenos basilêïon: entha d’ erithoi êmôn oxeias drepanas en chersin echontes. dragmata d’ alla met’ ogmon epêtrima pipton eraze, alla d’ amallodetêres en elledanoisi deonto. treis d’ ar’ amallodetêres ephestasan: autar opisthe 555 paides dragmeuontes en ankalidessi pherontes asperches parechon: basileus d’ en toisi siôpêi skêptron echôn hestêkei ep’ ogmou gêthosunos kêr. kêrukes d’ apaneuthen hupo druï daita penonto, boun d’ hiereusantes megan amphepon: hai de gunaikes 560 deipnon erithoisin leuk’ alphita polla palunon. en d’ etithei staphulêisi mega brithousan alôên kalên chruseiên: melanes d’ ana botrues êsan, hestêkei de kamaxi diamperes argureêisin. amphi de kuaneên kapeton, peri d’ herkos elasse 565 kassiterou: mia d’ oiê atarpitos êen ep’ autên, têi nisonto phorêes hote trugoôien alôên. parthenikai de kai êïtheoi atala phroneontes plektois en talaroisi pheron meliêdea karpon. toisin d’ en messoisi païs phormingi ligeiêi 570 himeroen kitharize, linon d’ hupo kalon aeide leptaleêi phônêi: toi de rhêssontes hamartêi molpêi t’ iugmôi te posi skairontes heponto. en d’ agelên poiêse boôn orthokrairaôn: hai de boes chrusoio teteuchato kassiterou te, 575 mukêthmôi d’ apo koprou epesseuonto nomon de par potamon keladonta, para rhodanon donakêa. chruseioi de nomêes ham’ estichoônto boessi tessares, ennea de sphi kunes podas argoi heponto. smerdaleô de leonte du’ en prôtêisi boessi 580 tauron erugmêlon echetên: ho de makra memukôs helketo: ton de kunes metekiathon êd’ aizêoi. tô men anarrêxante boos megaloio boeiên enkata kai melan haima laphusseton: hoi de nomêes autôs endiesan tacheas kunas otrunontes. 585 hoi d’ êtoi dakeein men apetrôpônto leontôn, histamenoi de mal’ engus hulakteon ek t’ aleonto. en de nomon poiêse periklutos amphiguêeis en kalêi bêssêi megan oiôn argennaôn, stathmous te klisias te katêrepheas ide sêkous. en de choron poikille periklutos amphiguêeis, tôi ikelon hoion pot’ eni Knôsôi eureiêi Daidalos êskêsen kalliplokamôi Ariadnêi. entha men êïtheoi kai parthenoi alphesiboiai orcheunt’ allêlôn epi karpôi cheiras echontes. 595 tôn d’ hai men leptas othonas echon, hoi de chitônas heiat’ eünnêtous, êka stilbontas elaiôi: kai rh’ hai men kalas stephanas echon, hoi de machairas eichon chruseias ex argureôn telamônôn. hoi d’ hote men threxaskon epistamenoisi podessi 600 rheia mal’, hôs hote tis trochon armenon en palamêisin hezomenos kerameus peirêsetai, ai ke theêisin: allote d’ au threxaskon epi stichas allêloisi. pollos d’ himeroenta choron periistath’ homilos 604 terpomenoi: 605 doiô de kubistêtêre kat’ autous molpês exarchontes edineuon kata messous. en d’ etithei potamoio mega sthenos Ôkeanoio antuga par pumatên sakeos puka poiêtoio. autar epei dê teuxe sakos mega te stibaron te, 610 teux’ ara hoi thôrêka phaeinoteron puros augês, teuxe de hoi korutha briarên krotaphois araruian kalên daidaleên, epi de chruseon lophon hêke, teuxe de hoi knêmidas heanou kassiteroio. autar epei panth’ hopla kame klutos amphiguêeis, 615 mêtros Achillêos thêke proparoithen aeiras. hê d’ irêx hôs alto kat’ Oulumpou niphoentos teuchea marmaironta par’ Hêphaistoio pherousa. When he had so said he left her and went to his bellows, turning them towards the fire and bidding them do their office. Twenty bellows blew upon the melting-pots, and they blew blasts of every kind, some fierce to help him when he had need of them, and others less strong as Vulcan willed it in the course of his work. He threw tough copper into the fire, and tin, with silver and gold; he set his great anvil on its block, and with one hand grasped his mighty hammer while he took the tongs in the other. First he shaped the shield so great and strong, adorning it all over and binding it round with a gleaming circuit in three layers; and the baldric was made of silver. He made the shield in five thicknesses, and with many a wonder did his cunning hand enrich it. He wrought the earth, the heavens, and the sea; the moon also at her full and the untiring sun, with all the signs that glorify the face of heaven- the Pleiads, the Hyads, huge Orion, and the Bear, which men also call the Wain and which turns round ever in one place, facing. Orion, and alone never dips into the stream of Oceanus. He wrought also two cities, fair to see and busy with the hum of men. In the one were weddings and wedding-feasts, and they were going about the city with brides whom they were escorting by torchlight from their chambers. Loud rose the cry of Hymen, and the youths danced to the music of flute and lyre, while the women stood each at her house door to see them. Meanwhile the people were gathered in assembly, for there was a quarrel, and two men were wrangling about the blood-money for a man who had been killed, the one saying before the people that he had paid damages in full, and the other that he had not been paid. Each was trying to make his own case good, and the people took sides, each man backing the side that he had taken; but the heralds kept them back, and the elders sate on their seats of stone in a solemn circle, holding the staves which the heralds had put into their hands. Then they rose and each in his turn gave judgement, and there were two talents laid down, to be given to him whose judgement should be deemed the fairest. About the other city there lay encamped two hosts in gleaming armour, and they were divided whether to sack it, or to spare it and accept the half of what it contained. But the men of the city would not yet consent, and armed themselves for a surprise; their wives and little children kept guard upon the walls, and with them were the men who were past fighting through age; but the others sallied forth with Mars and Pallas Minerva at their head- both of them wrought in gold and clad in golden raiment, great and fair with their armour as befitting gods, while they that followed were smaller. When they reached the place where they would lay their ambush, it was on a riverbed to which live stock of all kinds would come from far and near to water; here, then, they lay concealed, clad in full armour. Some way off them there were two scouts who were on the look-out for the coming of sheep or cattle, which presently came, followed by two shepherds who were playing on their pipes, and had not so much as a thought of danger. When those who were in ambush saw this, they cut off the flocks and herds and killed the shepherds. Meanwhile the besiegers, when they heard much noise among the cattle as they sat in council, sprang to their horses, and made with all speed towards them; when they reached them they set battle in array by the banks of the river, and the hosts aimed their bronze-shod spears at one another. With them were Strife and Riot, and fell Fate who was dragging three men after her, one with a fresh wound, and the other unwounded, while the third was dead, and she was dragging him along by his heel: and her robe was bedrabbled in men’s blood. They went in and out with one another and fought as though they were living people haling away one another’s dead. He wrought also a fair fallow field, large and thrice ploughed already. Many men were working at the plough within it, turning their oxen to and fro, furrow after furrow. Each time that they turned on reaching the headland a man would come up to them and give them a cup of wine, and they would go back to their furrows looking forward to the time when they should again reach the headland. The part that they had ploughed was dark behind them, so that the field, though it was of gold, still looked as if it were being ploughed- very curious to behold. He wrought also a field of harvest corn, and the reapers were reaping with sharp sickles in their hands. Swathe after swathe fell to the ground in a straight line behind them, and the binders bound them in bands of twisted straw. There were three binders, and behind them there were boys who gathered the cut corn in armfuls and kept on bringing them to be bound: among them all the owner of the land stood by in silence and was glad. The servants were getting a meal ready under an oak, for they had sacrificed a great ox, and were busy cutting him up, while the women were making a porridge of much white barley for the labourers’ dinner. He wrought also a vineyard, golden and fair to see, and the vines were loaded with grapes. The bunches overhead were black, but the vines were trained on poles of silver. He ran a ditch of dark metal all round it, and fenced it with a fence of tin; there was only one path to it, and by this the vintagers went when they would gather the vintage. Youths and maidens all blithe and full of glee, carried the luscious fruit in plaited baskets; and with them there went a boy who made sweet music with his lyre, and sang the Linus-song with his clear boyish voice. He wrought also a herd of homed cattle. He made the cows of gold and tin, and they lowed as they came full speed out of the yards to go and feed among the waving reeds that grow by the banks of the river. Along with the cattle there went four shepherds, all of them in gold, and their nine fleet dogs went with them. Two terrible lions had fastened on a bellowing bull that was with the foremost cows, and bellow as he might they haled him, while the dogs and men gave chase: the lions tore through the bull’s thick hide and were gorging on his blood and bowels, but the herdsmen were afraid to do anything, and only hounded on their dogs; the dogs dared not fasten on the lions but stood by barking and keeping out of harm’s way. The god wrought also a pasture in a fair mountain dell, and large flock of sheep, with a homestead and huts, and sheltered sheepfolds. Furthermore he wrought a green, like that which Daedalus once made in Cnossus for lovely Ariadne. Hereon there danced youths and maidens whom all would woo, with their hands on one another’s wrists. The maidens wore robes of light linen, and the youths well woven shirts that were slightly oiled. The girls were crowned with garlands, while the young men had daggers of gold that hung by silver baldrics; sometimes they would dance deftly in a ring with merry twinkling feet, as it were a potter sitting at his work and making trial of his wheel to see whether it will run, and sometimes they would go all in line with one another, and much people was gathered joyously about the green. There was a bard also to sing to them and play his lyre, while two tumblers went about performing in the midst of them when the man struck up with his tune. All round the outermost rim of the shield he set the mighty stream of the river Oceanus. Then when he had fashioned the shield so great and strong, he made a breastplate also that shone brighter than fire. He made helmet, close fitting to the brow, and richly worked, with a golden plume overhanging it; and he made greaves also of beaten tin. Lastly, when the famed lame god had made all the armour, he took it and set it before the mother of Achilles; whereon she darted like a falcon from the snowy summits of Olympus and bore away the gleaming armour from the house of Vulcan. Not only the Captain of Pirates and Revolutionaries, Corry Shores is also a faculty member of the Philosophy Department at Middle East Technical University in Ankara, Turkey. His latest posts will challenge your deepest thinking, as Corry is comprehensively covering Graham Priest’s An Introduction to Non-Classical Logic: From If to Is. Thank you for a wonderful rendering of both the story and the shield. Hi Kathleen. Your post is absolutely stunning and I have back tracked to Cory Shore where I found all those wonderful photo’s. Your knowledge of the Iliad is astounding, but I must confess I find it difficult to follow at times. I can quite understand your passion for the shield of Achilles it is truly magnificent. Hope all is well with you. Have a great weekend. Rita. Hi Kathleen, I think it’s just as slow here in Crete. The Greeks are so laid back. However, I’m pleased to hear you are settled again. Looking forward to your next post. Thanks very much and thanks for sharing!